What do you get when you cross an art exhibition and performance with a house party? The answer is Häxa House. 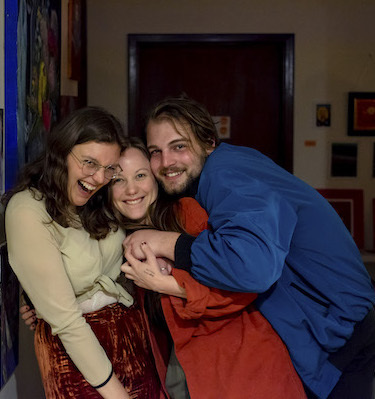 The brainchild of local independent artists Kelsey Diamond, Sophie Kruse and Joel Murray, Häxa House is an evening of live music, poetry, performance art and visual art, presented house party style. As part of this year’s KickstART Festival, Häxa House will be presenting an event in Northbridge. Nina Levy talked to Diamond, Kruse and Murray to find out more. 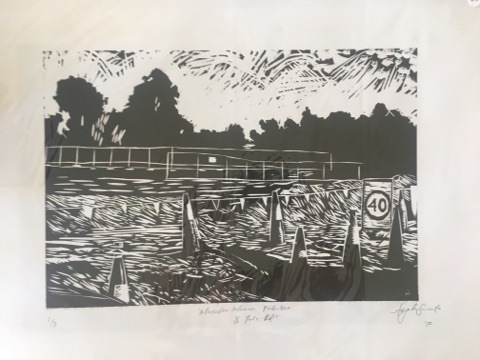 Sophie Kruse: I’ve always had a keen interest in the arts and have dabbled in visual art and poetry as a hobbyist but my main focus has always been music. A few years ago I began focusing on more experimental work and became involved with the modular synth community here in Perth. I’d never really considered a career in the arts, even though it was a constant fantasy in the back of my mind, until becoming more of an organiser. It made me realise how few opportunities there were for artists to establish communities in Perth. So, I decided to create some opportunities along with some amazing people who made it happen. L-R: Sophie Kruse, Kelsey Diamond and Joel Murray. Photo: Sam Beard. Joel Murray: I became interested in visual arts as a young kid. I always loved expression through art. Art was my favourite subject, and where I would invest the most part of my energy. I moved to Perth when I was 18, with the hopes of becoming involved in the art community, though never really had a desire to study it. I found myself surrounded by it in my own way, starting up little projects with friends, going to art events and having a few close friends who are amazing artists. I never deeply considered a career in visual art, although I know I will always be surrounded by it comfortably. Kelsey Diamond: I always loved making art, so naturally I decided to study art (and contemporary fashion) at uni. Curating was always something I wanted to do, and when Sophie and I met and became best friends in one night, I found out about Häxa House and I was so excited about the event. Not long after, I got involved and it’s been an amazing experience. NL: Why did you call your event “Häxa House”? What does “Häxa” mean? SK: The name Häxa means witch in Swedish. We thought this accurately captured the weird and magical nature of the kind of events we wanted to have. The name was fun, and it just stuck. Aisyah Aaqil Sumito will be exhibiting work at Häxa House from their ongoing project “A Place to Reckon”. NL: How did Häxa House come into being? And what kinds of events have you hosted to date? SK: One evening in early 2017 Joel Murray, Swedish sister Lovisa Sandlund and I were talking about wanting to create a communal space for artists of all disciplines and all levels to come together and share their work with each other, unrestricted by a gallery format. Later that evening we created a Facebook page for Häxa House without any plans, as a pact to ourselves to deliver on an event. When our first event came around and people were spilling out into the stairwell and the street of my small Beaufort street apartment, we knew that we had met a need for this kind of event in Perth. Since then, the visionary Kelsey Diamond has joined us to make Häxa grow. We’ve now hosted events in three different houses and had many more artists, poets and musicians on display, building a beautiful community that has enriched us beyond what we could have imagined. NL: And what will people experience when they attend this iteration of Häxa House? KD: We have a lot planned! We have 14 amazing artists involved in an exhibition that will span across two huge rooms at our venue, the Centre for Stories, which is based in an old house on Aberdeen Street in Perth. We are so excited to use this beautiful old venue with floorboards and high ceilings and a really homely vibe. We always decorate our events with lots of plants and twinkly lights, and create a magical atmosphere. There will also be amazing grazing platters made by Joel and adorned with flowers. The night will kick off in the courtyard, with poetry and live music from five local talents, followed by a performance art piece in the main room. Then there will be more music to finish off the night. Sam Huxtable performing at Häxa House. Photo: Anastasia Julien-Martial. NL: And what was the motivation to create this particular Häxa House event? 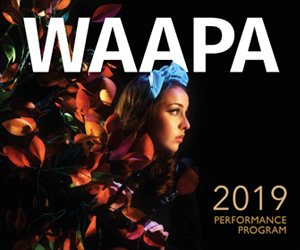 KD: We were approached by this year’s Propel Arts Kickstart Festival Program Coordinator Maddie Godfrey to put on an event as part of the festival. We knew Maddie because they read poetry at our very first event and had become a good friend of ours. In terms of the curation, we really wanted to showcase past Häxa House artists and performers as much as possible, as well as include some amazing people who had been on our wish list for some time. KD: Sam Huxtable has been in EVERY Häxa House event and makes work exploring the queer body and psyche, in their soft satin sculptures, metalwork/jewellery and performance. Sophie Nixon has also exhibited with us in the past, with her textiles that investigate processes of repair by repurposing worn, old garments or by incorporating live plant matter into fabrics. 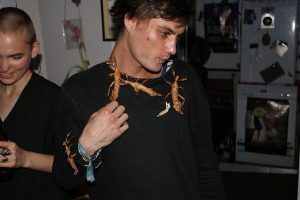 Teori Shannon with his giant insects. Photo: Jesse Ingram. Teori Shannon is also back with us once more. Teori is a taxidermy artist who brings giant insects to our events and lets everyone hold them. It’s terrifying and we love it. Sarah Sim is an incredible emerging dancer who won the multimedia award for this year’s Fringe for her video work The Divine Feminine. This work will be included in our event, which is really exciting. Her film bio reads “This is for anyone in love with what it means to be female. After watching this film, we hope that you will dance free and naked slowly, basking in the sun”. Amazing. Aisyah Aaqil Sumito will also be joining us, showing work from their ongoing project “A Place to Reckon”, a reiterated installation navigating personal history and multidisciplinary modes of storytelling. NL: What is your favourite part of the playground? KD: We unanimously voted for the swings! Is there anything more fun that swinging up really high and then jumping off? Häxa House takes place Friday 19 April, at the Centre for Stories. Pictured top are the Happy Girls and Annika Moses performing at ‘Häxa House IV: Bring Spring’. Photo: Sam Beard.